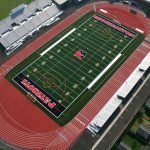 Synthetic running track surfaces are a beautiful addition to any facility and can yield tremendous benefits to a track program. But a track surface that is not installed properly will fail and result in damage that looks terrible and creates a safety hazard. As one would expect, running track surfaces can be very expensive and requires extensive training to install properly. With tightening budgets, many school districts are forced to go with the lowest bidder regardless of qualifications. As a result, projects are usually delayed, or worse, rushed to get in before the big game. Why do track surfaces fail? There are many reasons why a running track surface can fail. 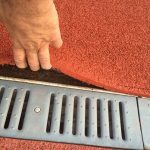 The American Sports Builders Association offers a national program that certifies track installers possess the knowledge and experience to install tracks properly. Certified Track Builders must have several years experience installing synthetic running tracks, must pass a comprehensive exam and must be re-certified every three years. At Nagle Athletic Surfaces, we never cut corners…ever. Make sure your hire an ASBA Certified Track Builder for your next track project. Quality…Service…Value. It’s what we do!